58 years of serving up delicious food has made this restaurant a leader in the industry! And we’re not just talking about breakfast here! They offer combo meals, French toast, waffles, crepes, omelets, salads burgers and much more! 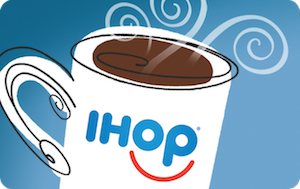 Now just think of the money you’ll save when you use a discounted IHOP gift card! Same great food, less money out of your pocket- that’s a winning combination! With over 1,600 locations nationwide, you’ll surely have no problem putting your discounted IHOP gift card to good use! Breakfast all day long and open 24 hours, are just two of the unbeatable perks of IHOP! And what’s more, they have a fresh, updated menu- complete with healthy options and family favorites that are sure to please everyone! Grab your discounted card today and save money on an American favorite! Gift cards also make excellent presents! Are you shopping for that special somebody who has everything they can want? If so, then what could be better than an IHOP gift card? Delicious food, any time of the day or night! In addition to pancakes and burgers, they offer many other delicious foods that are sure to please! Rooty Tooty Fresh ‘N Fruity pancakes are just a click away! Not only will an IHOP gift card save you money, but Cards2Cash also has listings for many other great stores! Check out our listings for Waffle House, Cracker Barrel, Denny’s, Bob Evans and more! At Cards2Cash we know how hard it can be to save money. We offer a large variety of discounted gift cards- saving you more money, every day! Do you have an IHOP gift card you would like to sell? Cards2Cash pays top dollar for lots of gift cards! Why carry around something you aren’t going to use when Cards2Cash pay you money for it instead? If interested, just stop in one of our retail locations for cash paid on the spot, or fill out our easy online form and we’ll get back to you with an offer! Don’t forget- Cards2Cash is your one-stop gift card shop!